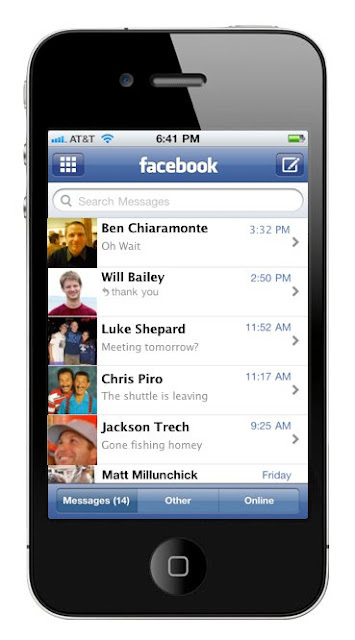 Today, Facebook is widely expected to announce that it is offering email to its members. Will that be the case? We’ll all find out soon enough. Mark’s here now, thanking people for coming to the various product announcements this year. Talking about Thanksgiving, hanging out with his girlfriend, talking with her family and friends and meeting high schoolers who makes him feel really old. I ask them what do you use for email, high schoolers say no, don’t use it. “What do you mean you don’t use email?” he says back to them, confused. They say it’s too slow. Not slow in delivery. Just too slow in formal. Think of person’s address, subject line. What do they use? SMS and Facebook. He says well, I find out about my messages on Facebook through email. They say they’re already there. 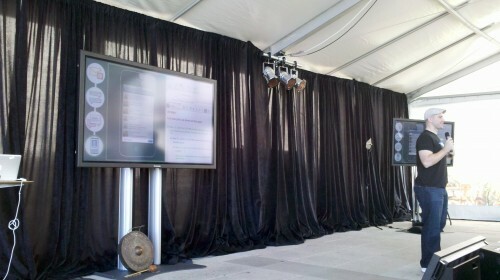 Facebook’s built products they think will help. Today, 350 million people actively using messages on Facebook. Not everyone who uses Facebook (about 500 million) but it’s a really simple system. More than 4 billion messages sent each day though the system. Vast majority is one to one messages between people. The 4 billion messages growing incredibly fast, faster than Facebook. Talking about some of the points above, which are on a slide. Personal, when you get SMS or IM, you know it’s from someone you care about. Email could be from anyone. 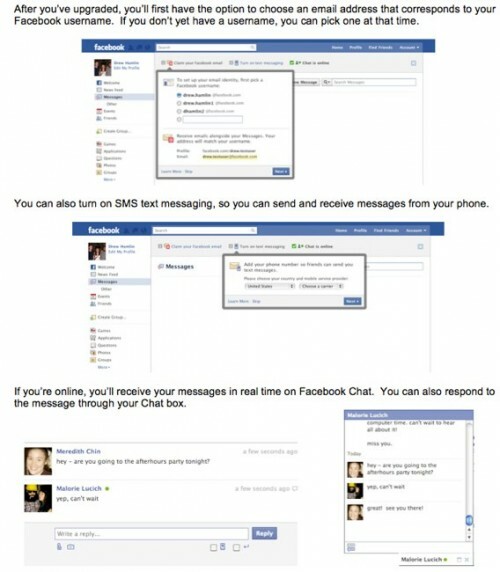 Simple, shouldn’t have a lot of features (this from Facebook, with 100 billion options that confuse the hell out of me? things should be simple, OK). Three main features of product today. 2) Conversation history. Conversation model in email is “archaic” — wow, Gmail brought in conversation views, and that was seen as a big advancement. Says have one thread with person. 3) Is “Social Inbox” – because we know who your friends are, we can do some really good filtering to make sure you get messages from people you only care about. There’s been talk about having whitelists in email in the past “but no one wants to make lists.” But with Facebook, you get that automatically. In social inbox, quality experience, and then you can also go to “this other box” where you can see other mail (I think he means Facebook mail will have a “not your friends” box. OK, Mark’s done, and Andrew Bosworth up to do a demo of the product. 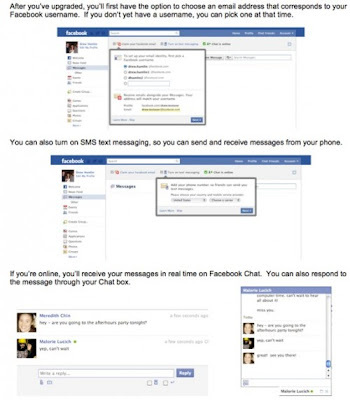 One of first thing thought, bring together Facebook Chat and Facebook Messages. Then realized need to bring more than that together. We have so many different ways to communicate, so way to communicate is fragmented. Wants to talk to his cousin who’s in high school, needs to text. His grandmother prefers email. Everyone will get @facebook.com email addresses, because yes, people will want email. But, “the system’s definitely not email.” More like chat. Talks about his grandmother having a box of real letters. “Where’s my box of letters.” Showing his conversation history with his girlfriend over the past 4 years. Context is important. Individual messsages might not be profound, but collectively can be. To build all this, rebuilt infrastructure using hBase (and lots of stuff to follow that will go way over my head). Haystack was extended, needed to ensure had attachments. Showing the Social Inbox, where there’s an “Other Messages” folder for stuff not from your friends. Don’t expect anyone to shutdown their Yahoo Mail or Gmail accounts. More that how people are shifting in high school. If we do a good job here, more people will rely on it, just because it’s easier and simpler. And maybe 6 months, two years out, some people will say this is the way as the future to work. Maybe email just isn’t as important a part and can push people more toward this immediate personal experience. Rolling out over next few months, starting with invite system. All the press here will be in the initial set. What doesn’t it do that you want? Mark: IMAP will come. It can send and receive but can’t work with other systems. Subject lines with multiple threads for one person. Don’t think that’s the way things will go, so going to make it so you have single conversation with one person (can’t wait to really see this, because wow, I usually have emails with multiple people. This sounds like a mess for the workplace, but we’ll see). Didn’t catch the next question, but part of answer from Bosworth, want things to feel like a conversation. Mark: We’ve tried to make it so people don’t have to think about this stuff. 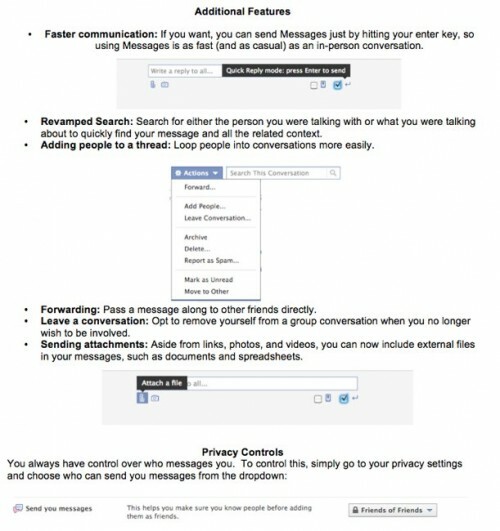 Try to make it so that if you send a message, Facebook knows where to send it (phone, email, facebook, etc). 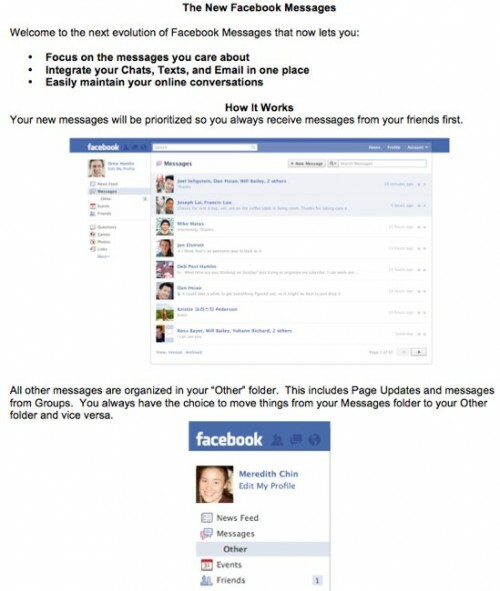 Mark: Maybe over time, but found it easier to unify SMS, IM, Email and Facebook messages for now. Question: Will there be ads? Impact on competition with Google? Mark, ads work same as rest of Facebook, space for ads, but not targeting based on the text of the content [which is what Gmail does]. Our ad system is based on you put in you like Green Day, we’ll tell you Green Day’s coming, big different from other ad systems that track you around on the web. “I think Gmail’s a very good product” — talk about this as a Gmail killer, to them, this is a killer of their internal “gigabox” system. “We just think this simpler kind of messaging is how people will shift all their communication.” [which is, in the end, saying yes, they hope this is a Gmail killer]. Can you kill stuff? Off the record mode like Gmail? Yes on kill, no on off the record. 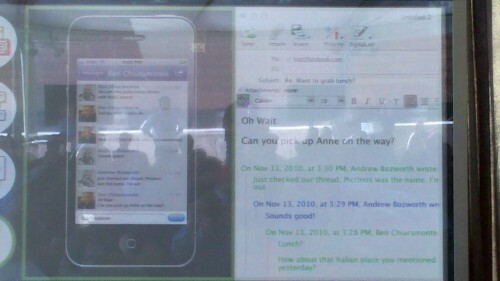 Mark, one nice thing is this is unified, so in its system, you can IM with someone who on the other side gets an email or a text. What’s really important is people can obviously say they don’t want information to be stored, can delete things, but the “off the record” metaphor that Gmail didn’t make sense. 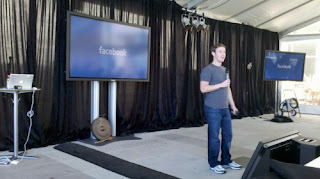 Biggest challenge for Facebook to date? 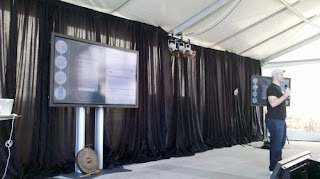 Question on social graph that I didn’t fully catch, sorry, live blogging and updating can be hard. 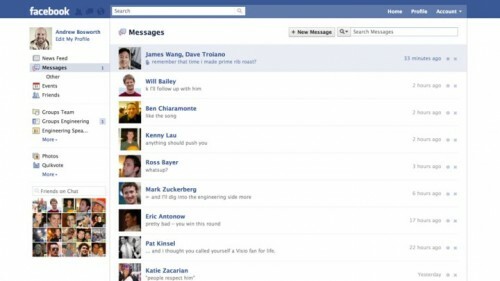 Mark: if someone emails you who is not part of Facebook, in your network, it’ll go in the “other” folder. “But we expect that will quickly get solved.” Sounds like you’ll have ability to set rules if, person, of course doesn’t join network. Is there further filtering you can do, like if your mom sends you junk you don’t care about? No, but there’s only going to be one thread with her. 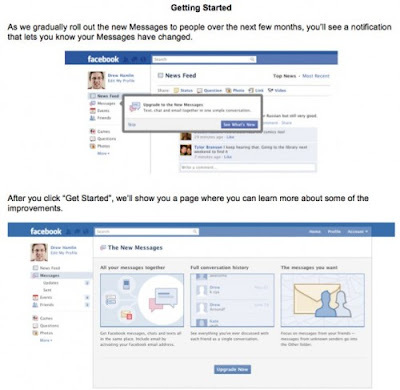 What about Facebook corporate email? Mark, the farm bureau will give them fb.com, and jokes Facebook won’t sell farm subsidies. Big debate internally, lots inside like their address, but “if we want to give the best to users” should give them Facebook, because brand is so strong. Can you forward messages? Yes. In group conversation, you can add people or let people leave the thread. Storage limits? If you’re a “good” users and not trying to find the limits, you should be fine. Question: Can you redirect email to Facebook? No immediate plans. Have optimized this to be focused on friends. And that’s it. Facebook blog post now up here, two images above (the clear ones) from that. A new site about the Facebook Messages improvements is supposed to be here, but I don’t see it working yet.